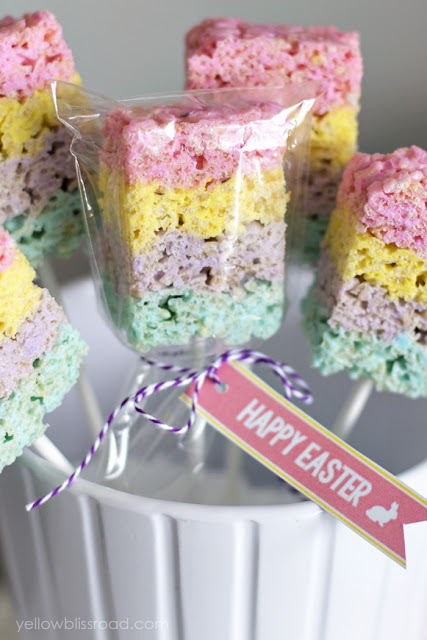 Rice Krispie Treats with a twist – they’re made with marshmallow Peeps and layered for a beautiful, colorful Easter treat! 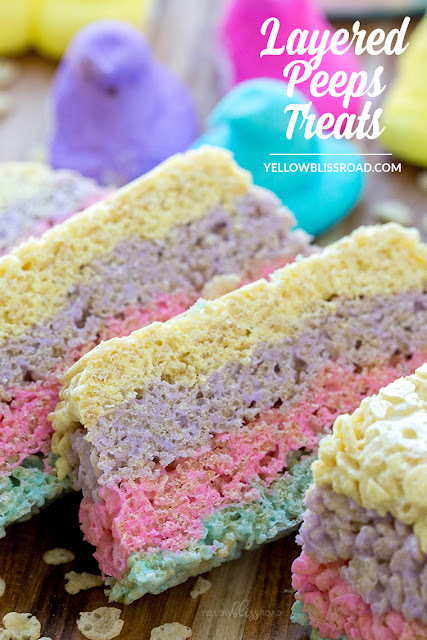 Make these Layered Peeps Treats for all of your spring gatherings! I know, I know, it’s still snowing in a lot of the country, but Valentine’s Day is over and that means there are Peeps in the stores! I may have literally jumped and clapped when I saw them. I have had a vision for these little layered treats in my head for over a month now and I’ve been dying to finally make them. Have you seen all the colors they have? Check out this huge pack of Peeps in six colors! A few tips – Because they’re made with Peeps, these treats definitely have a distinct flavor. We happen to love the flavor of Peeps so we love it. However, a lot of people have asked if you can make these with regular marshmallows and food coloring. While that isn’t my choice, the answer is yes, you can! Just use the basic Rice Krispie Treats recipe (find it on the cereal box) and divide the ingredients by the number of colors you plan to use. Then prepare each color in a separate bowl, adding a few drops of food coloring to each bowl as you go until you’ve reached your desired color. Then layer as seen in the photos above. This method definitely does add an extra step and the colors don’t get nearly as bright, but if you’re not a fan of Peeps (say what???) this will yield similar results. Prepare an 8-9" loaf pan by lining with foil and spraying lightly with cooking spray. Divide the Peeps by 10s of the same color - 10 pink, 10 yellow, etc. (use any colors you like). In a deep, medium sized microwaveable dish, microwave 10 of the same color peeps with 1 tablespoon of butter on high for 45 seconds. Because microwaves vary, watch closely so the Peeps don't flow over the sides of the bowl. Stir butter and Peeps together until fully melted and incorporated. (*tip - spray a spatula with cooking spray before stirring). Stir in 1 1/2 cups of cereal until fully coated. Press firmly into the loaf pan. Repeat steps 3-4 with the other Peeps colors. Allow to cool completely (1-2 hours) before slicing. 0 Response to "LAYERED PEEPS CRISPY RICE CEREAL TREATS"